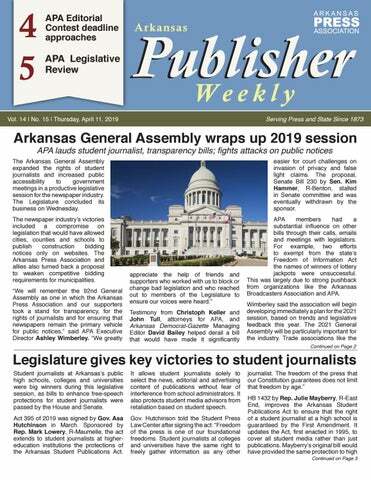 The Arkansas General Assembly expanded the rights of student journalists and increased public accessibility to government meetings in a productive legislative session for the newspaper industry. The Legislature concluded its business on Wednesday. easier for court challenges on invasion of privacy and false light claims. The proposal, Senate Bill 230 by Sen. Kim Hammer, R-Benton, stalled in Senate committee and was eventually withdrawn by the sponsor. The newspaper industry’s victories included a compromise on legislation that would have allowed cities, counties and schools to publish construction bidding notices only on websites. The Arkansas Press Association and allies also turned back a proposal to weaken competitive bidding requirements for municipalities. APA members had a substantial influence on other bills through their calls, emails and meetings with legislators. For example, two efforts to exempt from the state’s Freedom of Information Act the names of winners of lottery jackpots were unsuccessful. This was largely due to strong pushback from organizations like the Arkansas Broadcasters Association and APA. Legislature gives key victories to student journalists Student journalists at Arkansas’s public high schools, colleges and universities were big winners during this legislative session, as bills to enhance free-speech protections for student journalists were passed by the House and Senate. It allows student journalists solely to select the news, editorial and advertising content of publications without fear of interference from school administrators. It also protects student media advisors from retaliation based on student speech. Act 395 of 2019 was signed by Gov. Asa Hutchinson in March. Sponsored by Rep. Mark Lowery, R-Maumelle, the act extends to student journalists at highereducation institutions the protections of the Arkansas Student Publications Act. Arkansas Municipal League, Arkansas Association of Counties and Arkansas Association of Educational Administrators are expected to ramp up efforts to remove public notices from newspapers. “While this year’s legislative session was a success, there are challenging times ahead for our industry and challenges to be expected at the Capitol in two years,” Wimberley said. “It’s exceedingly important that we are proactive over the next 20 months to demonstrate our industry’s value and commitment to Arkansas through the vital service we provide to its residents and to our nation’s democracy.” Here are updates on some key bills: SB 409 Following weeks of negotiations, the Senate and House both this week adopted Senate Bill 409. The legislation was amended to ensure Arkansas newspapers continue to publish public notice of government construction project bidding opportunities. Initially, the bill sponsored by Sen. Scott Flippo, R-Mountain Home, would have given cities, counties and schools the option of placing their public notices on a website. The original bill would have allowed the notices to appear on any website, and Flippo was joined in committee testimony by a Louisiana-based vendor who operates a bidding website. would open the door to sweetheart deals with vendors at the local level. SB 230 SB 230, Sen. Hammer’s bill to make it easier to file and receive damages in invasion-of-privacy and defamation lawsuits, was withdrawn by the sponsor after it failed to advance out of the Senate Judiciary Committee. The bill and an amended version were rejected twice by the committee. The original bill was filed in response to inaccurate reporting, Hammer said, citing the incident at the Lincoln Memorial between a Native American and high school students from Kentucky. The amended bill was more targeted at media outlets and would have lowered the bar for lawsuits if someone failed to retract and remove information if proven to be false or inaccurate. HB 1928 On the last day of the session, the Senate narrowly adopted HB 1928 by Rep. Vivian Flowers, D-Pine Bluff. That bill, passed by an overwhelming margin in the House, requires audio recordings of most public meetings subject to the Arkansas Freedom of Information Act. The recordings must be available to the public under the law and must be kept for at least one year. HB 1928 was supported by the APA and the Arkansas Freedom of Information Act Task Force. It advanced to the governor for his signature. The Arkansas House went into recess at about 1 p.m. on Wednesday afternoon. execution process or any information that discloses the manufacturer or dispenser of the lethal injection drug. Violation of the act is a Class D felony. HB 1382/SB 306 Bills in the House and in the Senate to restrict access to information about lottery winners each passed their respective chambers, but neither were passed in the other chamber by the time the session ended. HB 1382 by Rep. Jim Sorvillo, R-Maumelle, would have created a FOIA exemption to shield the identity of any winner of $500,000 or more. The secrecy provision in Sorvillo’s bill would not have applied to elected officials who were lottery winners. Only the IRS, Legislative Audit, the FBI and Arkansas State Police would be permitted to know the names of lottery jackpot winners. SB 306, by Sen. Larry The Arkansas Senate went into recess just before noon on Wednesday. Teague, D-Nashville, would have given week after SB 231 failed to advance from winners of $500,000 or more the option the Senate State Agencies Committee to have their names kept confidential and SB 521 never received a hearing. After sponsors of HB 1417 amended the bill to make it more palatable to the FOIA Task Force and the FOIA Coalition, the Legislature passed the measure intended to protect the identity of confidential informants in law enforcement investigations. The measure creates a FOIA exemption for the names or identifying information about informants if the release of the informant’s name could be expected to endanger the life or safety of the informant or his or her immediate family. and unnecessary mandate on local school districts. Mayberry said she is considering bringing back the bill for the 2021 session, especially if more schools drop journalism from their course offerings. “Obviously, we believe a journalism course in high school teaches students valuable skills that they wouldn’t receive anything else, and re-establishing that requirement is a priority for our association,” Wimberley said. “We will keep working with Rep. Mayberry to move forward with a plan to make sure all Arkansas students have an opportunity to learn our trade. 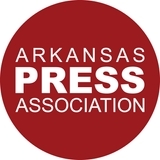 Last chance to submit APA editorial contest entries With the deadline just a week away, Arkansas Press Association members are encouraged to submit their entries now for the 2019 APA Better Newspaper Editorial Contest. The deadline for entries is April 19. To enter, visit www.newspapercontest.com/ Contests/ArkansasPressAssociation. aspx. The annual competition for journalists, photographers, editors and page designers highlights the best work of APA member newspapers. The online entry form contains a full list of categories, all in five divisions: smaller weeklies, medium weeklies, larger weeklies, smaller dailies and larger dailies. The contest is open to employees of APA newspapers for work published between Jan. 1, 2018, and Jan. 31, 2018. Entries will be judged by a panel of out-of-statejournalists. For more information, contact Terri Cobb at (501) 374-1500 or terri@ arkansaspress.org. Journalism students in Arkansas, Mississippi, Oklahoma and Louisiana are eligible for the Investigative Reporters and Editors’ James Richard Bennett Scholarships. The scholarship is made possible by Dr. James Richard Bennett, professor emeritus of English at the University of Arkansas. Applications are due April 15 for the scholarship that covers an IRE membership and complimentary registration, lodging and travel expenses to the annual IRE conference in Houston in June. Applicants must provide their college transcript, resume or LinkedIn page, two clips demonstrating reporting skills and letter of support that shows why the student deserves a scholarship for IRE training. Visit ire.org for more information or to apply. Advance-Monticellonian hires new reporter Monticello native Melissa Orrell has been named as a reporter for the AdvanceMonticellonian newspaper in Monticello. Orrell, a former Marine, was a journalist while serving in the Marine Corps. She was a staff reporter for the Tri-Command Tribune at Marine Corps Air Station in Beaufort, South Carolina, and was a public affairs representative for the Air Station. She trained in print journalism, broadcasting and photojournalism at the Defense Information School in Fort Meade, Maryland. She is a graduate of Drew Central High School.